Surprisingly simple with six ingredients and you have this mild sweet, spicy, and salty spread, (opposite flavors attract) that tantalizes every taste bud in each bite. Serve with crackers. This recipe is from Holly Clegg, author of Too Hot in the Kitchen: Secrets To Sizzle At Any Age. Mix together cream cheese and curry, spread on serving plate. Carefully spread chutney over cream cheese layer. 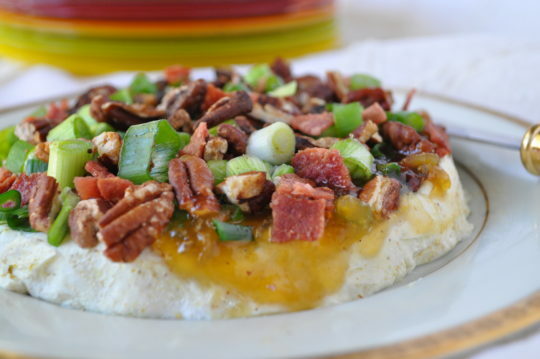 Sprinkle with green onions, pecans and bacon. Cover, refrigerate until serving. Spicy Advice: Mango chutney is in the grocery with jars of chutney and sauces.